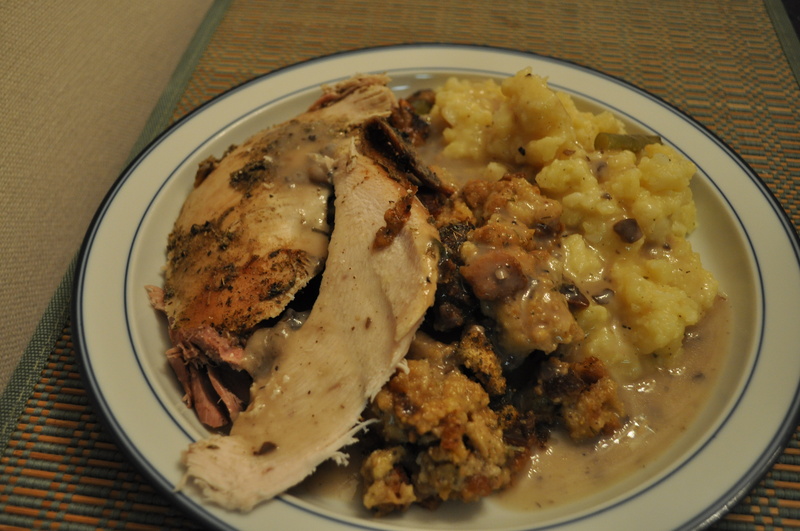 My mostly local Thanksgiving meal. Done tonight for just the two of us. Pretty traditional this year. Roasted turkey. 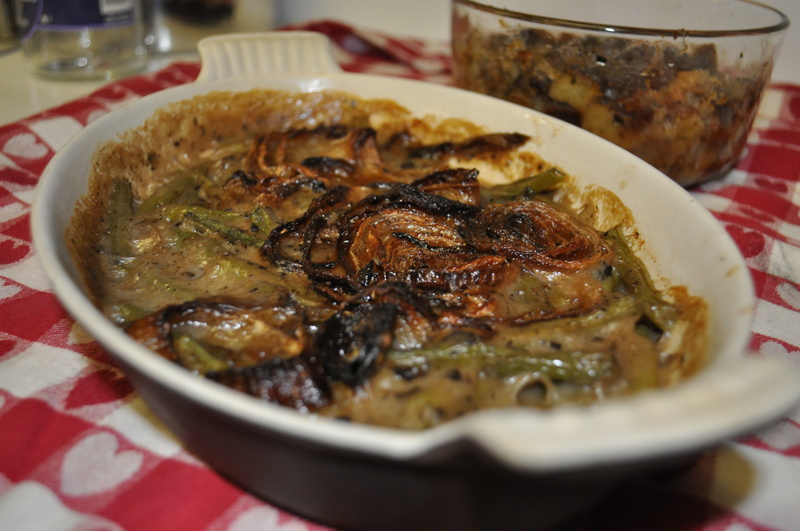 Green bean casserole. Mashed potatoes. Sausage dressing. Every element of the meal had local ties. Let’s start with our turkey. An eleven pound Maple Lawn Farm fresh “hen”. Brined for sixteen hours in advance. I found a basic apple cider, salt, brown sugar, orange peel, bay leave, garlic, rosemary and water brine. Roasted at 450 degrees for 30 minutes, and 90 minutes at 350 degrees. Trickling Springs butter under the skin. 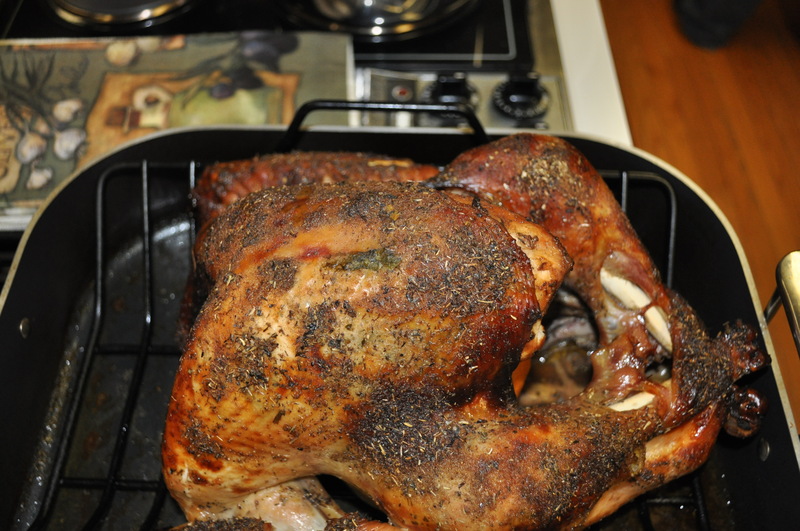 Grapeseed oil rubbed over the top, and a poultry mix sprinkled everywhere. Really moist turkey this year. The right amount of time in the brine, and it wasn’t overcooked. I have a crock pot full of bones, skin and the innards, with a couple gallons of water, which will cook all night to make stock. Side dishes this year. My take on classics, but revved up a bit. Mashed potatoes included goat cheese, butter and milk. These were CSA potatoes, a mix of Yukon Gold and white potatoes. I made a green bean casserole using Breezy Willow’s beans. Blanched them first, then put them in a casserole with some organic condensed cream of mushroom soup I got at Roots. Half of the container became the base for the gravy. The onion on top the beans was a CSA yellow onion that I roasted yesterday until it was crispy. It added flavor without all that breading and greasiness the canned onions have. The dressing was simple. Bread cubes mixed with turkey stock (I started the stock early today, using only the innards and water, celery, carrots and scallions. Cooked up about 4 ounces of Boarman’s homemade country sausage and mixed it in. A little sage, salt and pepper. Baked alongside the green beans. Complementing the meal, a Finger Lakes Pinot Noir. 2007 Konstantin Frank. Really a soft wine. Glad we opened it. It is just starting to fade a bit. All in all, just enough food. I didn’t go overboard on anything other than making just a bit too many potatoes. As for leftovers, I have two cups of shredded turkey to make a soup. One leg to use for a lunch salad next week. One complete breast for a salad or dinner. A couple of thighs for another dinner. Keeping it local. Supporting small businesses. I may not have shopped today, but I did pretty well. Posted in CSA, Farms, Food, Local Businesses, Locavore, Real Food, Wine and tagged cooking, crock pot cooking, crockpot soups, CSA, farms, Food, foodie, local businesses, Locavore, real food, wine. Bookmark the permalink. 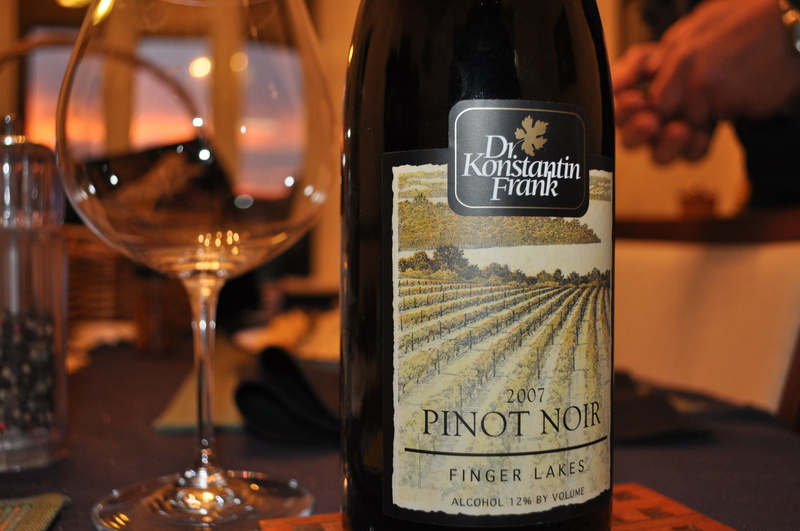 Dr. Konstantin Frank wine – one of our favorite Finger Lakes wineries! !